Donald Trump appeared on Good Morning America Wednesday and continued to partake in one of his favorite campaign pastimes: badmouthing his fellow GOP presidential candidates. 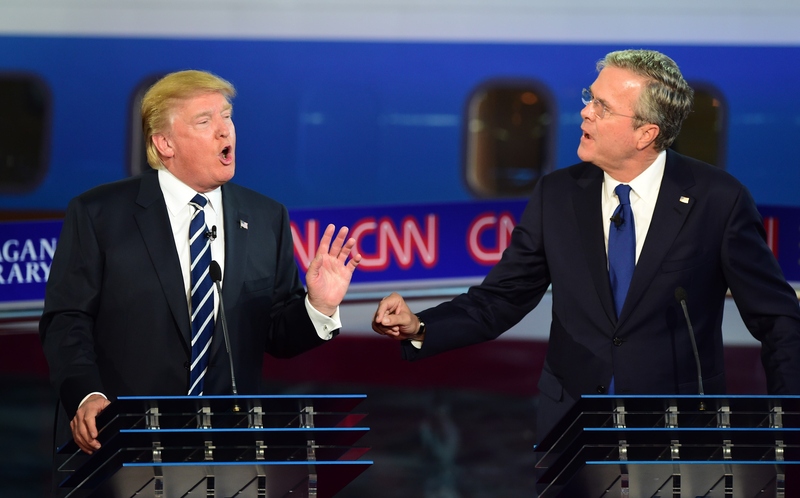 Trump continued his ongoing feud with Jeb Bush during the show, saying that Bush is attacking him because he's "embarrassed" that he hasn't gained much support in the polls. Trump is currently at the height of his lead in the Republican field, with 32 percent support. Retired neurosurgeon Ben Carson is second with 22 percent, Florida Sen. Marco Rubio is third with 10 percent, and Bush is fourth with seven percent. Trump and Bush's feud reignited Friday, when Trump said that Bush's brother, former President George W. Bush, didn't keep America safe, since the 9/11 attacks happened during his presidency. Bush defended his brother, calling Trump "pathetic." Then, on Tuesday, Bush wrote an op-ed attacking Trump's "dangerous views on national security" in The National Review. "Let’s be clear: Donald Trump simply doesn’t know what he’s talking about," he wrote, comparing Trump to documentary filmmaker Michael Moore. "And his bluster overcompensates for a shocking lack of knowledge on the complex national-security challenges that will confront the next president of the United States." Well, look, Jeb has had a very hard time. He’s way down in the polls. He’s doing very poorly. He’s embarrassed by what’s happening. So he has to attack me to try to get his numbers up. The last thing we need is another Bush. We’ve seen what happens. The last thing we need is another Bush and he understands that and the voters understand that. You know, to compare me to Michael Moore; that one hasn’t happened before. CNN noted that it's unclear whether Bush is truly attacking Trump to get his poll numbers up, and that this is more than likely just a characteristic Trump showoff claim. Trump was the one who reignited the feud on Friday by placing all of the blame for the 9/11 terrorist attacks on Bush's brother. People can't believe it. It was the only political book I'd ever done and people can't believe that I mentioned [him]. Yeah, OK, Great And Powerful Trump.